Edelbrock RPM Air-Gap manifolds incorporate the same race winning technology used on the Edelbrock Victor intakes. The air gap design features an open air space that separates the runners from the hot engine oil – resulting in a cooler denser charge for more power. 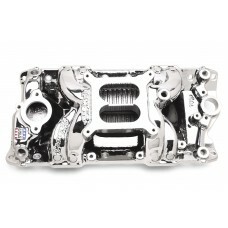 These intakes are a high-rise dual-plane design and are part of the Edelbrock power package. The Performer RPM package is designed to dramatically increase performance over stock engines in the 1500-6500 rpm range. Provides power like a single-plane and throttle response like a dual-plane. Because of the high rpm (above 5500) capabilities of this package, other engine modifications are recommended such as improved oil system, adjustable roller rockers and high performance pistons with 9.5: 1 compression. The Performer RPM package parts available include intake manifold, timing sets, camshaft, carburettor and cylinder heads. This intake can be used in conjunction with other camshafts within the same 1500-6500 rpm range. The Performer RPM Air-Gap intake is a great choice for high performance street engines in light cars. This is the same intake as EDEL7501 but with the Endurashine finish. Designed for street 1955-86 262-400 cubic inch small-block Chevrolet V8. Will accept OEM 4-bbl or Edelbrock Performer series carb. Will not fit 1987 and later Chevrolet cast iron heads – will fit Edelbrock and other 1987 and later aluminium heads. Recommended carb EDEL1405 or EDEL1407 for most applications. Manifold height A-4.20”, B-5.25”. Use intake bolt set EDEL8504.